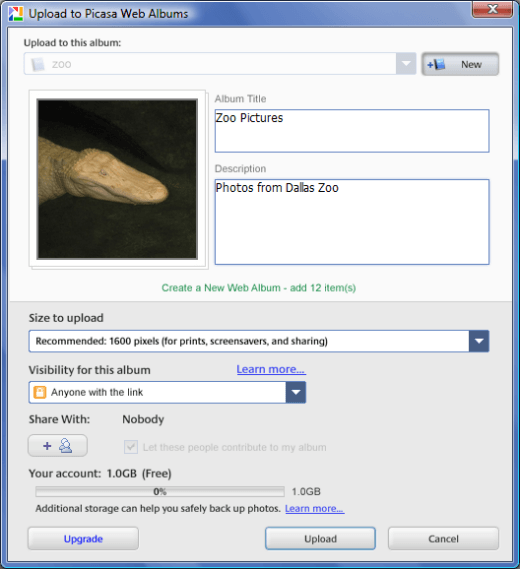 In the Picasa photo library, select the photos you wish to upload to Picasa Web Albums. Select the Upload button in the Photo Tray below the photo library window. Under Upload to this album, select an album from the drop-down menu. 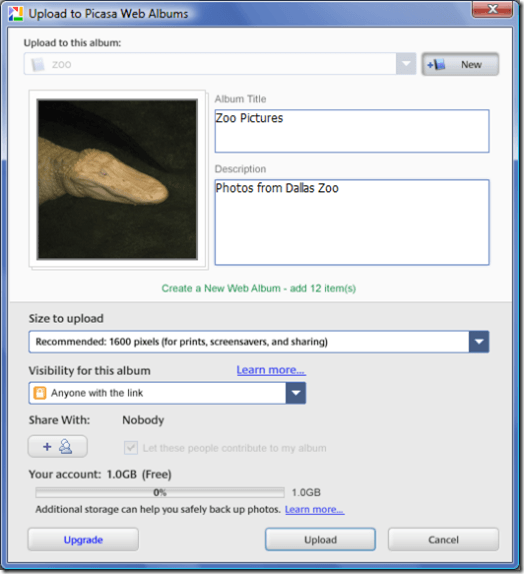 If you don’t want to upload to an existing album in Picasa Web Albums, click New. Type a title and description for your new album. Then select a size for upload. Select Original if you want to back up your photos. Select Recommended if you plan to print the photo from Picasa Web Albums, use it as a screen saver or share it with family and friends. Choose Medium if you just want to share your photos. If you plan to use your photos on a blog or website, select Small. Keep in mind that you only get 1 GB of space with a free account. Under Visibility for this album, select whether you’d like your album to be public, private, or available to anyone with the link. Then select whether you’d like to share your album with family, coworkers or friends. If you choose to share your photos with one of these groups, you can also select to let them contribute to your album. When you’re finished selecting your options, click Upload. 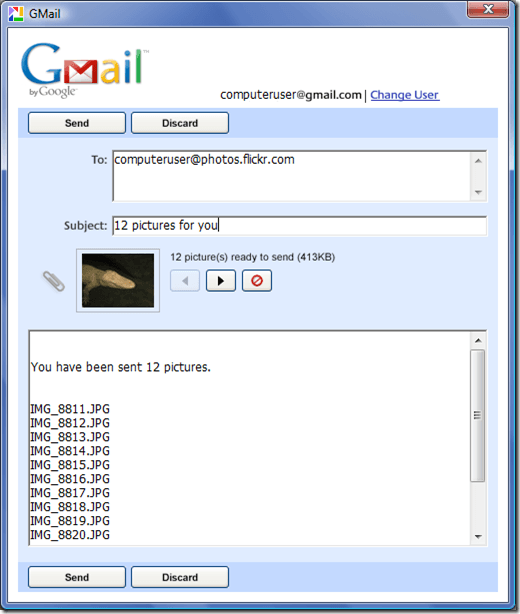 You can easily upload your photos to Flickr using Picasa’s email upload feature. Since Flickr has an Upload by Email feature as well, all you have to do is send the photos to your Flickr email address. 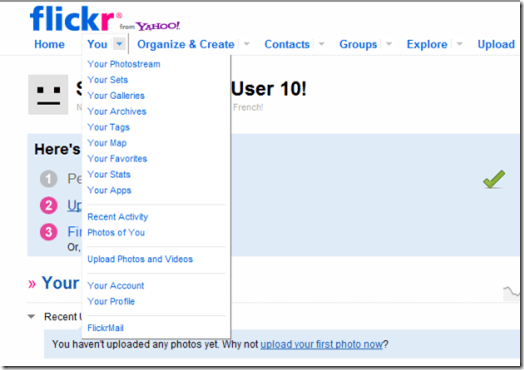 To get started, sign in to your Flickr account. In the left side of the page, click You, then select Your Account from the drop-down menu. Click Emails and Notifications. Copy your Flickr upload email address, then go to your Picasa library and select the images that you’d like to upload. Click the Email button in the photo tray at the bottom. Select whether you’d like to upload your photos using your default email program or by Gmail. 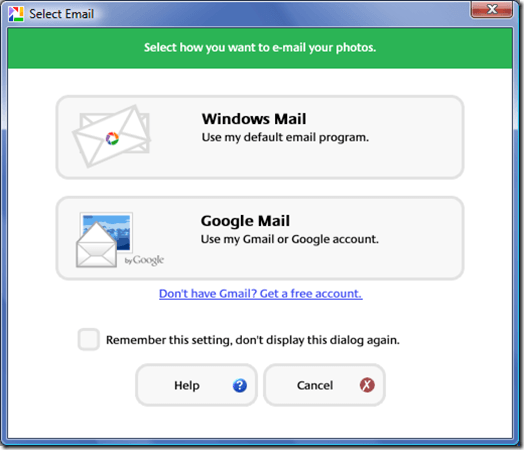 If you don’t use email software or if you don’t have a Gmail account, then you must configure an email software program or sign up for a free Gmail account before continuing. 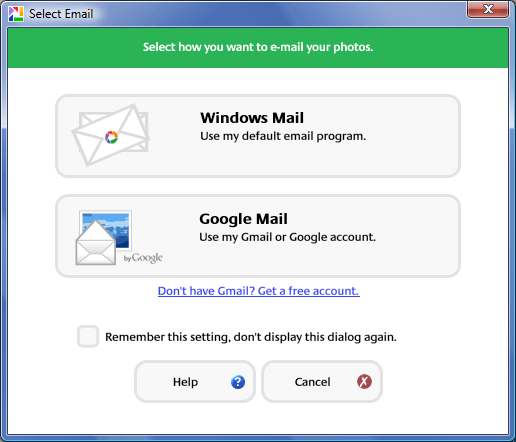 If you would like to sign up for Gmail through Picasa, click the Google Mail: Use my Gmail or Google account button, then click the blue Want Gmail? link above the sign-in field. After creating your account, sign in through the same dialog window. Paste your Flickr email upload address into the To: field, then click Send to complete your photo upload. For more tips on this subject, you can read Migrate pictures from Flickr to Picasa.